This first sketch above comes from Ulysses Albert III (contact info below). He did a magnificent job in manifesting the ferocity of Grendel and Calypso as they would appear three quarters into the novel...hardened, inflexible, merciless and maybe even a little jaded. GRENDEL: These two pieces of concept art (above and below) for the book come again from the immensely talented artist Ulysses Albert III. He can be reached through his website at www.ua3.carbonmade.com or by his email: ualbert3@gmail.com. 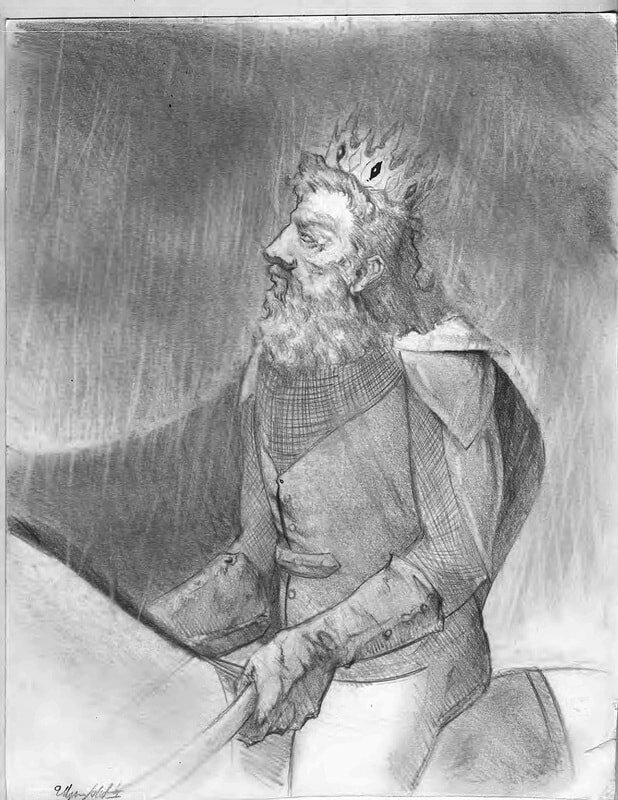 What I'm most proud of is his alternate vision of Grendel (above) - the manner in which he renders the second version of the creature gentle and even "provincial" but with an underlying, latent violence in his countenance. 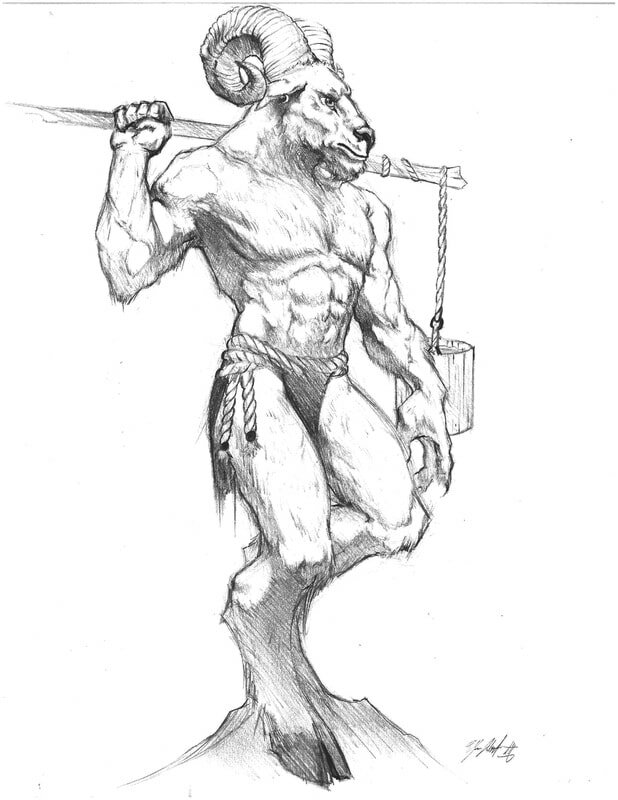 Honestly, it's not easy when an author says "draw me a Minotaur with the face of a goat on the head of a bull and blend it in with the body of a man." Ulysses managed this task brilliantly, with two distinctly different visions of the novel's most multi-faceted character. (ABOVE) Here, Ulysses gives us his alternate, older version of Calypso, at the moment after the Shapeshifter's first murder in the novel. When I asked for this second version of Calypso I asked Ulysses to capture a vision of her, this time, as older than her current and ex-lover Eric Draco - she would be described more as hardened and handsome than "pretty" - an attractive but dangerous older woman - like the roles that the actress Joan Allen or Cate Blanchett often plays in movies. 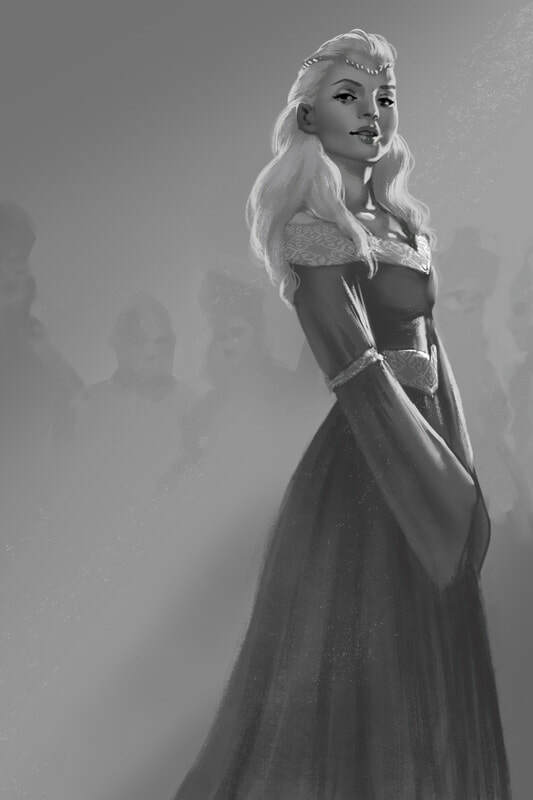 I really like what he did with this sketch of her. 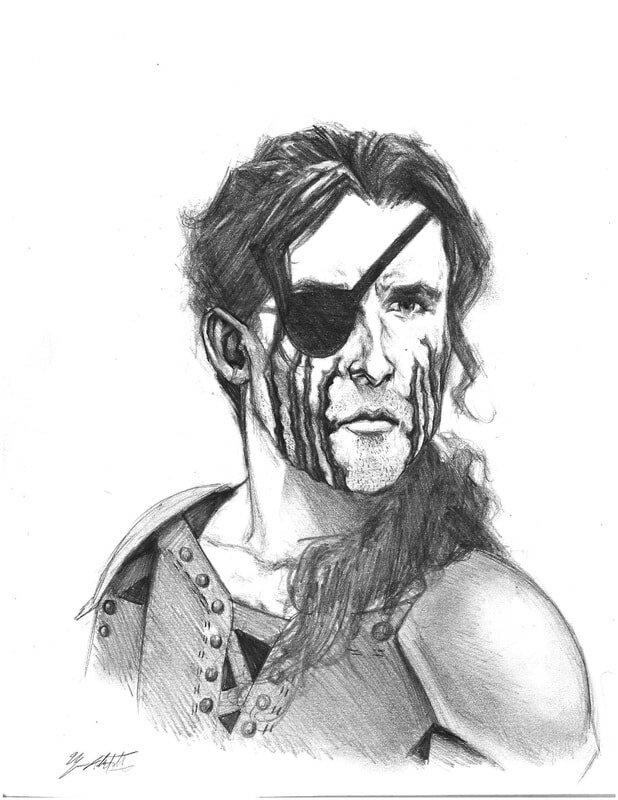 This sketch (ABOVE) is the splendid artwork of Lisa Clark. She can be reached at lmclark91@gmail.com. 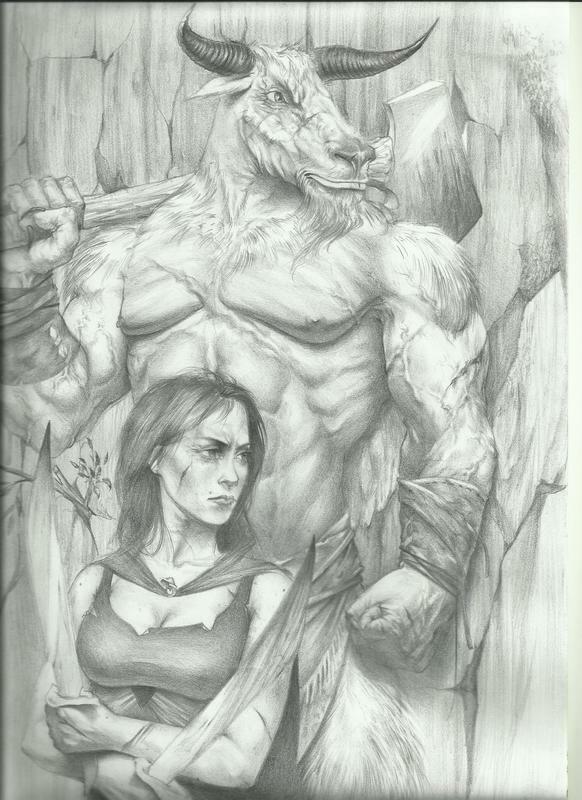 Lisa truly captured the latent ferocity and long-suppressed bitterness of Grendel, and her rendition of his muscularity is spot-on. Truly impressive work, Lisa. This next set of sketches (above and below) come once again from a magnificent artist named Lisa Clark. She did for me another version of Calypso which I believe truly captured the character's seductive qualities. She can be reached at lmclark91@gmail.com. 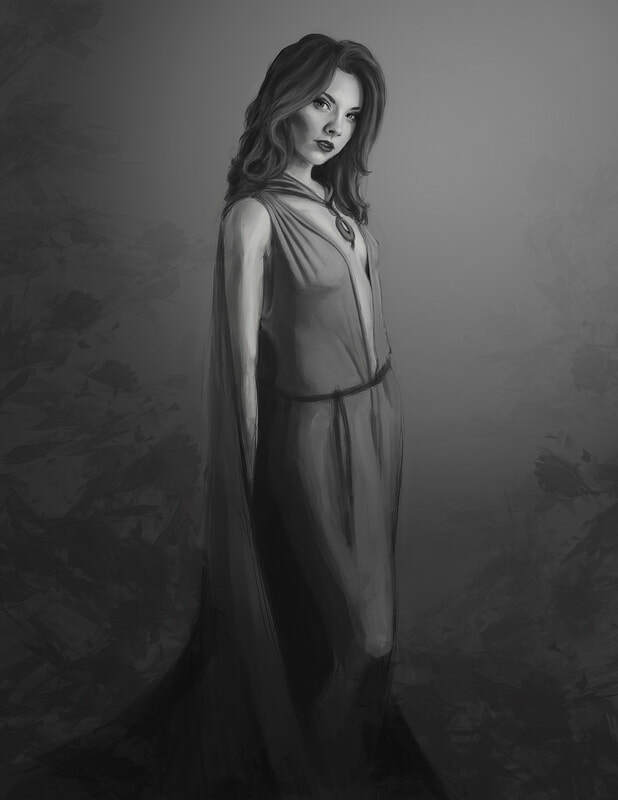 Her version of Calypso is just a bit younger but still retains that hardened edge carried by someone who has retribution at the forefront of their mind at all times. So...Sharilyn Flagg. 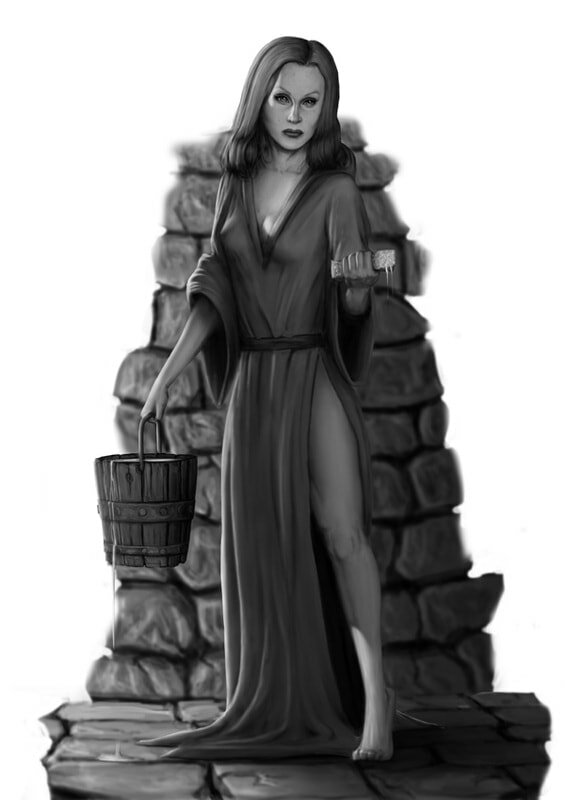 Upon first observation, one might mistake her for a servant girl with that sponge and bucket. 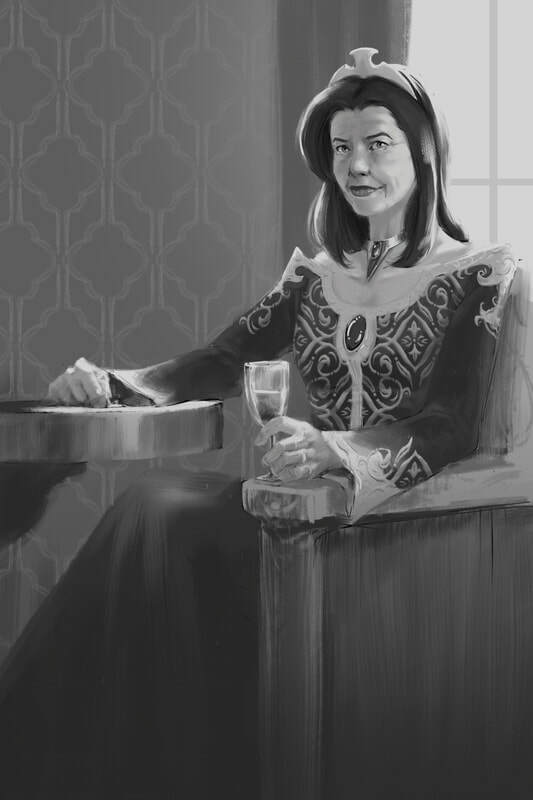 But fans of the book will recognize this as the moment when Sharilyn, a master of the Dark Arts, applies "Temuljin's Curse" to a certain unfortunate Royal Guardian. The curse, applied topically and then burned into the skin, renders its victim with a new identity, false memories of a life they never lived, and no remnant of their former self. I could say more but that would involve too many spoilers! BELOW is another great illustration from Ulysses (He can be reached through his website at www.ua3.carbonmade.com or by his email: ualbert3@gmail.com.) 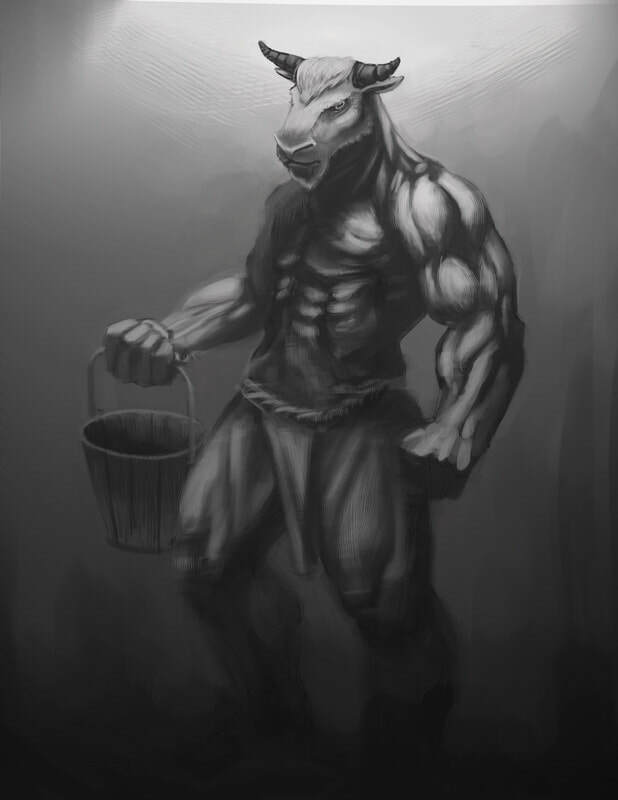 This time he brings us Eric Draco, also known as "Eric the Vain", in many ways the protagonist of the story (though not COMPLETELY when you consider Grendel and Calypso). I asked Ulysses to sketch Eric as he looked after his "transformation" - meaning after he offers his sacrifice (as evidenced by his appearance) to Anthrough-Genus. 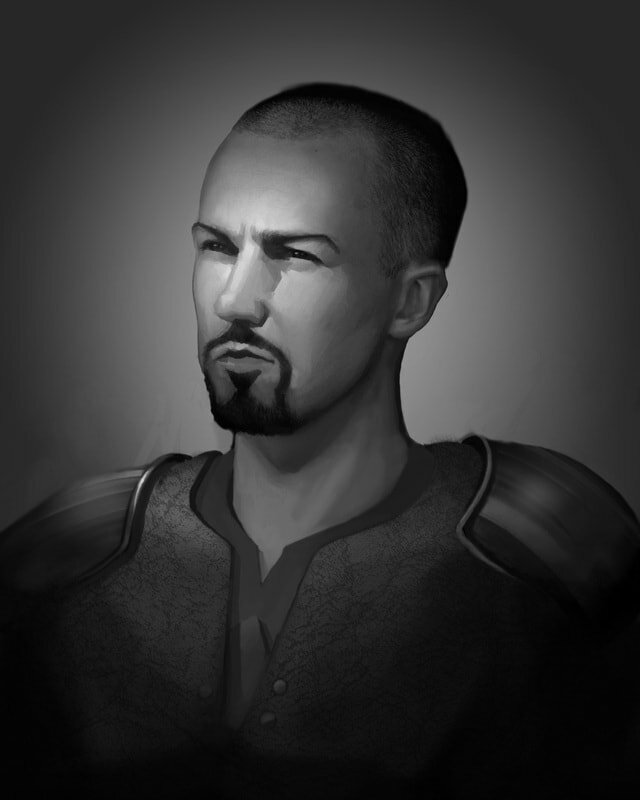 BELOW is another sketch by Carlos Contreras: the elder Guardian and Eric's older brother, Conrad. 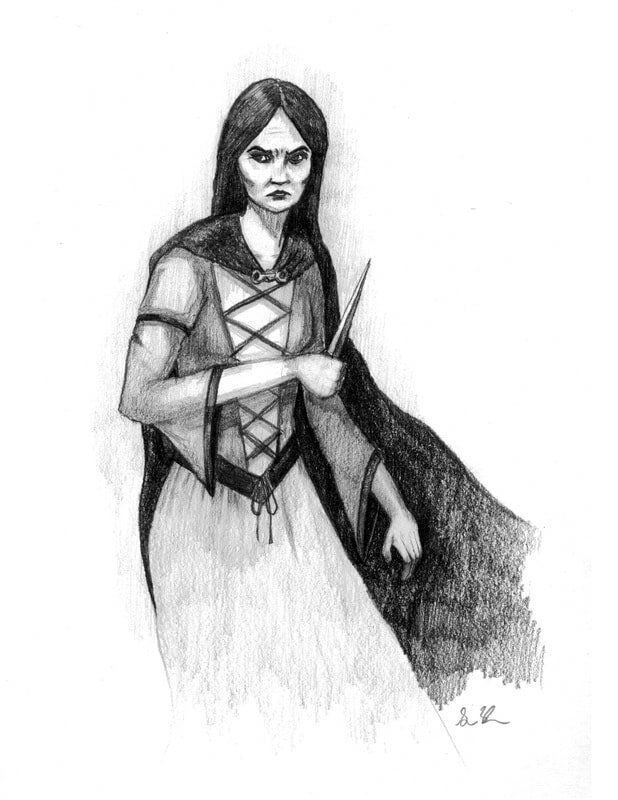 The picture (BELOW) of Calypso comes to us via the artistic skills of Sophia Zhu (who.canada.syrup@gmail.com). 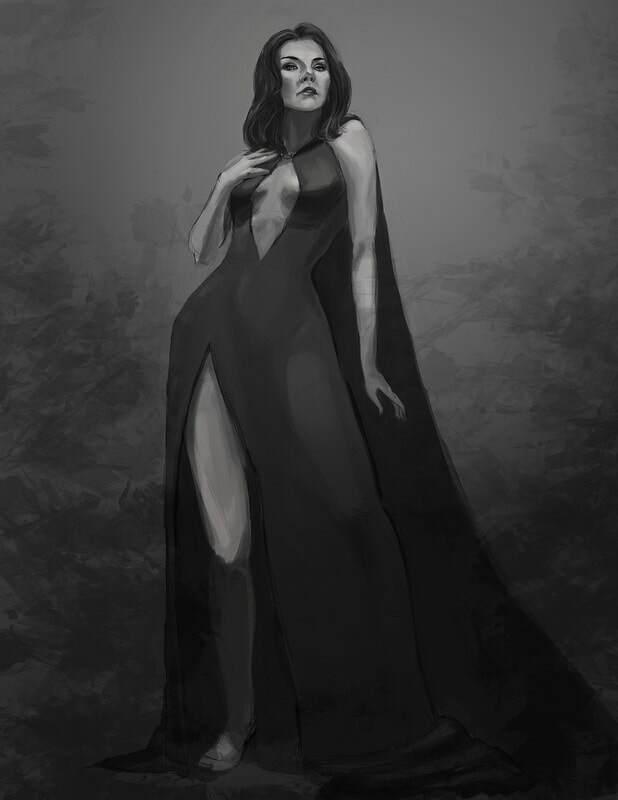 It's another great rendition of the Shapeshifter, this time with stiletto in hand. I envision this sketch as taking place at the moment before Calypso is forced to kill Labraid in the Mantesse Marketplace, as the soldier pursues her amidst the tumult of Conrad Draco's appearance on the Presentational Platform. 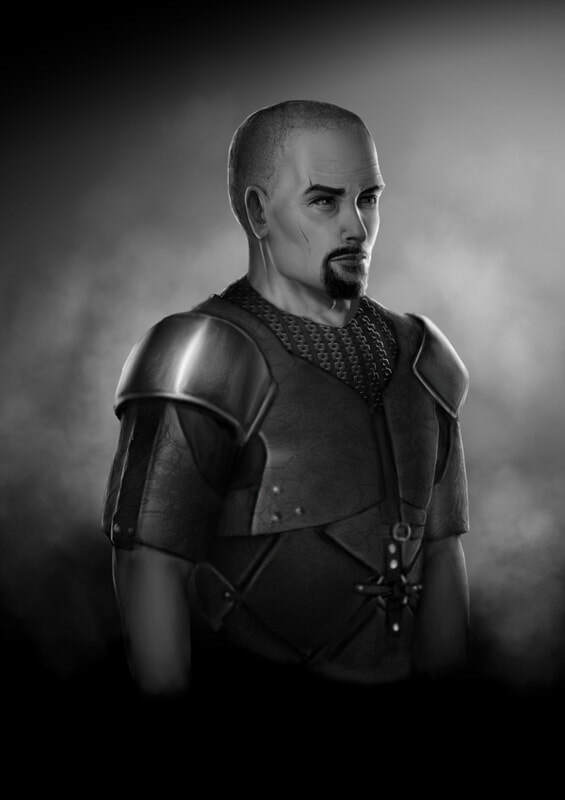 (BELOW) This rendition of Conrad Draco comes to us via the illustrating talent of Javier Harriman (javier_harriman@yahoo.com). (Below) Ulysses Albert III completed this excellent rendition of King Trenton VI. It depicts him at the moment before the Battle of Killian's Clearing, seated on horseback. Though outnumbered, his kingdom devastated by the plague, he refuses to bow his head to the downpour. "All power hinges on perception," as the king would have said. The second of Clark's recent additions (below) is of Meridian, Trenton's niece, who, like Helen of Troy, brought about the destruction of an entire kingdom. 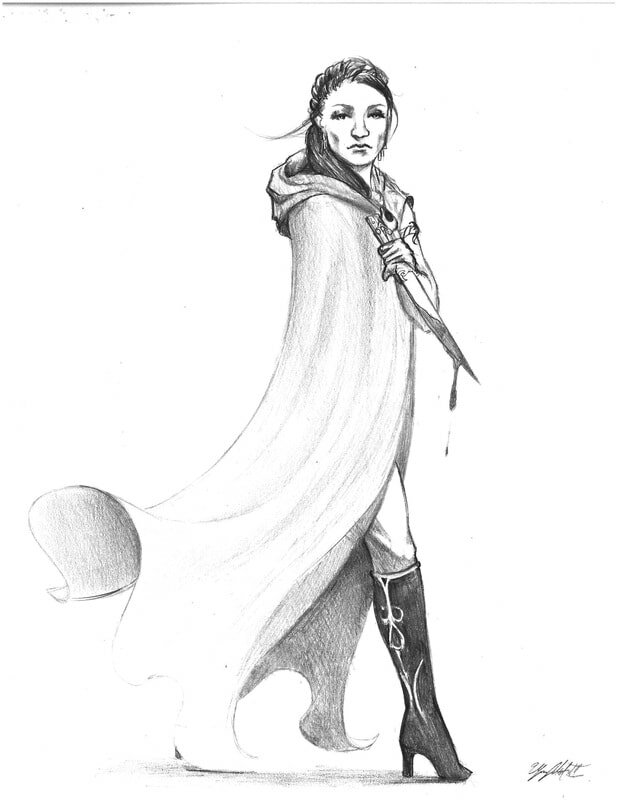 The shades behind her symbolize Meridian's entourage of admirers. Below is a sketch of a Clayface victim - the one Benny drew. I mentioned him on my Wondercon page. Here's how cool Benny is. I told him about the plague in SHARDS and said I liked his work. I told him I wanted to hire him to do a rendition of a Clayface Carrier - one of the handful of unfortunate souls whose every pore swells into a boil. When I asked for Benny's business card, he said he didn't have them on him. Instead he made a business card with this Clayface Carrier on the front and his contact info. on the back. I mean, how cool is that? And he did it with a single black pen in less than 15 minutes! I definitely want to be working with him in the future. 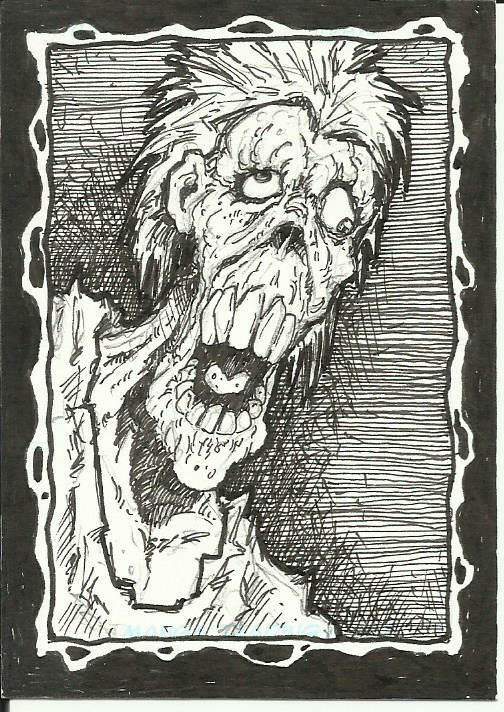 Look to see more of Benny's SHARDS work - the illustrator for "Zombie Outlaw" (see Wondercon page) in the future.